Welcome back to our recurring “Interview with a Watch Maker” series. In this series, we’re talking with a variety of folks from across the industry, and get insight into their background, what drives them, and why they’re coming up with the designs they’re creating. Today, we’re speaking with Marvin Menke, the man at the helm of Hemel Watches. WristWatchReview (WWR): What is your history with wristwatches? Marvin Menke: I entered the wristwatch world like most other guys have. My dad gave me my first watch (a Timex hand-winder) when I was a boy; he thought every gentleman should have a nice watch on his wrist. I grew up with the Swatch, Fossil and Guess watches like a lot of teenagers of my generation did. I always liked watches – and I liked having a lot of them. I did work part time in marketing for Swatch when I was in college which was a nice gig. When I graduated FIT, and started working, my appreciation began to deepen as I became aware of better fabrication and movements. It was during this time that I began working in design, which naturally began to inform my purchasing decisions. By the time I decided to design my first watch, I had a pretty good idea of what I wanted to do. WWR: Do you feel right now is the right time to become a watch maker? Is there any such thing as a “right time”? Marvin Menke: It’s hard to say if there’s such a thing as a “right time” although the time did seem right for me. It depends on your circumstances and what you’re trying to achieve. We live in this digital age; this age of the internet which has made so many resources for the entrepreneur so accessible. Things like sourcing, marketing, selling, collaborating and market research can be done at a whim, from anywhere and with the most minimal of investment. This is only part of the formula, though; you still need to have a concept, a product. This is where my background comes in. My experience in design, product development, photography, marketing and copywriting has really allowed me to express a brand with minimal investment. If you think about it, these are all things that a lot of companies spend a lot of money on, so being a creative puts an entrepreneur at a distinct advantage in that regard. There are also market and consumer trends to consider. You can see a reaction to the aforementioned digital age that goes across industry and lifestyle. The slow food movement, the localvore movement, the vinyl record revival, a renewed interest in film photography, guys shaving with safety razors again. There are so many ways you see especially young people, seeking authenticity in what’s a rapidly consuming digital life filled with more disposable goods. It makes sense that there’s a market for traditional watches; an enduring icon from another time. Still, I was astounded at the amount of online venues that exist where folks are talking about mechanical watches. The level of conversation is way above anything you ever hear in stores, but again, this goes back to the internet. It really is the most powerful intellectual tool in the history of mankind, – and we all walk around with it in our pockets! One of the recurring things I saw people talking about is the cost of this hobby and how value is such a motivating factor. It was in this area that I identified the white space opportunity where Hemel resides. We offer higher-end specifications at an approachable, under $400 retail price point. I basically wanted to bring the things that make a $1,000 watch down to under $400. So was it THE right time to start a watch company? The popular thing to say is no, because we see the major players hemorrhaging; that’s all mainstream consumers hear about in the news. But there are still tons of interested consumers out there and for a boutique firm that’s able to react quickly to the market, to a targeted consumer and with overlapping in-house talent, yes, now is the right time for Hemel. WWR: Yes, the intersection of “old school” watches and shaving is one I am intimately familiar with! Before you became a watchmaker, what was your intended career path in life? How did you come to watch making? Marvin Menke: I knew from a young age that I wanted to be a creative professional. All the steps I took were intended to bring me closer to that goal. As a watch consumer, I’m always looking for classic pieces. And as a creative, I’m always inspired by the details that make these watches so timeless. So putting my passion for collecting and my passion for designing together was just a completely natural progression for me. My goal with Hemel is to construct a physical narrative framed by the visual cues of actual, historical timepieces; a simple and elegant sort of story that we can wear on our person. And unlike a smartwatch, which will eventually become obsolete in a few years, a mechanical watch becomes an instant heirloom. WWR: Heirloom – that is quite a lofty goal. What inspired this particular watch? 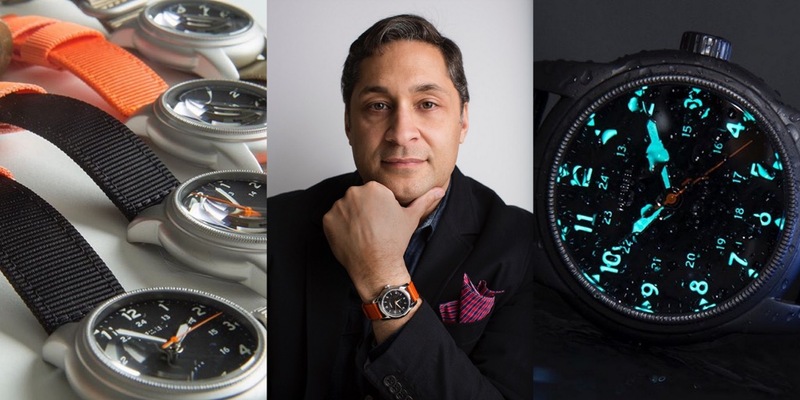 Marvin Menke: Nothing has driven watch innovation more than military need: the screw down crown, luminosity, the rotating bezel, the NATO strap, and even the very migration of the pocket watch to our wrists. I just love the plain-spokenness of the field watch, the quiet intensity and practical nature of the battlefield tool. I’m not alone in this; military watches are highly collected by watch guys and most every brand has done their own version of it. If you look at original twentieth century watches actually worn by military personnel, there really is so much there to admire. And I think that military watches, probably a little bit more so than other watches, are a wonderful lens through which to begin to view history. Inevitably, researching these watches opens up doors to the countries and events from which they evolved. Marvin Menke: We’re in the middle of a customizable product and getting the factories to understand that we want to give our customer options has been a difficult thing to communicate. This goes back to the old way of doing business, where a company just cranked out product and force fed it to the masses. If we’re sincere about engaging with today’s shoppers, I believe that we are accountable for reacting with reciprocity. Listening means nothing unless you convert that exchange into action. So finding the right manufacturing partners has been a bit of a hurdle, and we’ve had to change hands on deck a few times. The journey has been worth it, and we’re going to have a very surprising product for next year, probably in the first quarter. WWR: Nice teaser there – and we’ll come back to engagement in a moment. First, though, where do you think the industry is moving? Marvin Menke: Like most other retail industries, the watch industry will continue to have to share the market with online sellers. The millennial shopper is the largest online shopper, and as they gain more purchasing power, the trend is likely to increase, especially as online channels for obtaining information on watches gains momentum. Millennials also devour social media content more than any other demographic, so it’s rational to expect that manufacturers expand their footprint in that arena as pressure increases at the brick and mortar level. Discussions on the future of this industry always seem to include smartwatches, and I think that we’ll continue to see companies experiment with digital tech, having varied results. But I really doubt we’ll see a watch company abandon the gears and springs for full-on digital. The problem with digital technology is that it’s so disposable. It literally becomes obsolete within a few years, which is the opposite of what we think of when we think of proper mechanical watches. Wrist watches are the original hands free device, and there will always be a certain appeal to them because of the fact that mechanical technology is also a green technology. WWR: I think we’re on similar pages there (though I am test-driving a smart watch as we speak). Where do you fit within that future? Marvin Menke: Hemel was conceived, born, and lives online. We see a continuation of this strategy, where we have a direct line of communication with our audience through chat and with simple, strong graphics. Boutique watchmaking appears to have become a bit homogenized, so Hemel crafted a different kind of visual approach to its marketing. By communicating authenticity through simple, bold and colorful graphics, we are elevating the brand above the market confusion to refine its position in the marketplace. This sort of fun, simple and definitive approach allows Hemel to create a modern and accessible brand story. WWR: There’s more of that engagement sneaking in. Let’s tackle that head-on – how do online communities play a part in what you’re doing? Marvin Menke: Online communities and influencers can give an authentic voice to your brand. When you can turn customers or folks who have an affinity for the product into brand ambassadors, it’s a little harder for your product to be dismissed. By building on this organic connection, you get a collaboration that has a built in enthusiasm coming from both sides. Interested shoppers can sense that as they seek to determine what your brand values are. Let’s face it, we define ourselves now more than ever by the brands we buy, and consumers are paying increased attention to what a brand stands for. The older paradigm began and ended with product – but now buyers seek more depth. WWR: What are you doing to develop a strong community feedback loop? How does that community feedback change the watch business? Marvin Menke: I began the HM Series before I knew about the enormous online community of watch lovers. By the time I started selling them though, I had begun to visit the forums and social media platforms. Watch guys know what they want, and are happy to express it. I can relate! Engaging with them helps to guide the movement of Hemel in the marketplace. I think it’s highly important for brands to get involved with their respective communities. On the one hand, a company can identify and cater to the needs of consumers more readily; on the other hand, they can access valuable demographic data. More importantly, buyers want to know that the companies they’re dealing with are authentic and not some faceless corporation putting out disingenuous product. Community involvement sends the message that a brand wants to have a conversation – that there’s a real person listening to them, not a team of salaried employees. This is where you see a lot of the higher profile brands not getting it right. The ones that are on social media are there talking to the consumer, not with the consumer and it’s part of why they’re hemorrhaging. Again, look at the trends. You see this happening across other categories also like food and beverage, personal care, apparel, etc. The big guys are losing market share to the market challengers led by people every bit as passionate about the product as is their customer. The digital influence works both ways, and the future of commerce will understand this. With the upcoming Hemel project, we’re experimenting with direct consumer feedback. We’re very excited to bring forth to market a wristwatch that the community has helped develop. WWR: That’s definitely a great way to connect with your customers. How do you define your ideal customer? Who is it, in your mind, that wears your brand’s watch? Marvin Menke: The Hemel customer is concerned with a fair cost to value ratio. According to an Urban Gentry Channel poll, the most popular price bracket among watch enthusiasts is between $400 and $500, and we’re right at the beginning of that. So we get a lot of folks who are ready to graduate from the fashion watch category, but maybe aren’t quite ready to buy a $1,000 watch. That said, we have gotten quite a few of the more sophisticated watch guys who understand what our $400 watch gets you: surgical grade steel, sapphire, C3 lume, a proprietary case and a high beat automatic movement. Our luxury is practical-minded, so we get a lot of folks from across the spectrum. But beyond that, our consumer finds it comforting, maverick even, to be a part of something that can function off the grid. And that’s what it’s like to have a mechanical watch – the watch relies on you for functionality as much as you rely on it to tell time;, the order by which we organize our lives. You’re literally a part of each other. WWR: What is it that defines your watch? What characteristics are identifiably “Hemel”? Marvin Menke: More premium specs at an accessible price point. In addition, our watches have surprising details, and we understand that great design is when you’ve taken something that everyone knows but made it a little better, a little cooler. A lot of customers expect a certain amount of familiarity in their timepieces but don’t want to keep buying the same watch over and over again. WWR: Indeed – the small details can make or break a watch. What are your guiding principles when making design choices? Marvin Menke: Design is at its best when used as a tool to create cohesion across all consumer touchpoints as it seeks to reinforce brand attributes – the goal is to create a lasting impression. Research based design decisions create clarity and market differentiation so for me, it’s all about driving sales, making a relevant appeal to the customer and defining our niche. WWR: How do you think about design and its role in your life? Marvin Menke: Design surrounds us. It tells us who we are, and what we aspire to be. Design seeks to make our lives easier, to help us, to solve problems. You can tell right away when you walk into a space or sit at a table or drive a car or hold a pen to what extent the end user’s experience was considered. Tragically, there are many cases of thoughtless, rather than the more appropriate thoughtful design. And the ironic thing is that you don’t even notice the best design – the best design fits seamlessly into your life. Bad design you feel right away. For example, think about classic watch cases that were simply enlarged to capitalize on the giant watch craze, and how the strap ends extend and just hang over your wrist. WWR: I, for one, will be quite happy to see that trend die out. What would the crowning lifetime achievement be for you and your brand as a company? Marvin Menke: Creativity is its own reward. There’s a satisfaction that comes from dedicated work, a fulfillment that brings you to your best self. I’m grateful for the opportunity to have been able to contribute something to the world of microbrands. You know, the watch guys are such purists, so when they post a photo of your watch on social media, it’s really such an honor because you know it comes from someplace real. Each acknowledgment becomes a small trophy in its own right.